"Never say never" is a slogan that characterizes Roy Borstad's attitude when it comes to initiatives in hockey, and community service in general. He moved to Grande Prairie in 1944, at the age of eleven. Even as a school kid he was inventive and resourceful. After high school he went into business and gave generously of his time to the community with a special devotion to sports and recreation. When it comes to community service and getting a job done he has the heart of a lion and the persistence of a pit bull. His 50 years of involvement with senior hockey began in 1954. In 1963 he served on the Memorial Arena Commission, a group that was responsible for the operation of the arena. He was a driving force behind the installation of the first artificial ice surface in the city an important remedy for uncertain ice conditions. From 1965 to 1971 Roy was an active member of the Grande Prairie Parks and Recreation Board that developed dual outdoor ice surfaces in what is now known as Muskoseepi Park. Since1966, Roy has worked with the Grande Prairie Athletics in such varied portfolios as sponsor, manager, treasurer, and president. He continues to offer the team support through coordination of fundraising with the local Bingo Association. He can still be seen selling tickets at Athletic games. He worked tirelessly along with other volunteers such as Legend Roy Peterson to build and maintain skating and hockey facilities for Grande Prairie kids. He was among the volunteers who took turns at flooding neighborhood rinks with a fire hose – a cold numbing exercise while trying to prevent ridges and ripples from developing when cold water meets ice and immediately freezes. Roy’s voluntary activities within the community reach far beyond hockey including the Grande Prairie Fire Department, the Kinsmen, Rotary Club, the Canada Games Committee, the Alberta Lung Association, and local women's and men's fastball. The Lifetime Hall of Fame Award as a Sport Builder was given to Roy in 1980 by the Alberta Fastball Association for his 40 years of dedication as an organizer, coach, umpire and sponsor. More recent honors include the 1987 George Repka Award for Community Service to the Citizens of Grande Prairie and a Lifetime Achievement Award from the Alberta Multi-Sport Development Council. Roy is proud of his hometown and believes that “Grande Prairie is the greatest place to be”. He gives generously of his time and considerable ability to make it so. As an outstanding builder of Grande Prairie recreational facilities and programs we salute Roy Borstad, as “a man for all sporting seasons”. 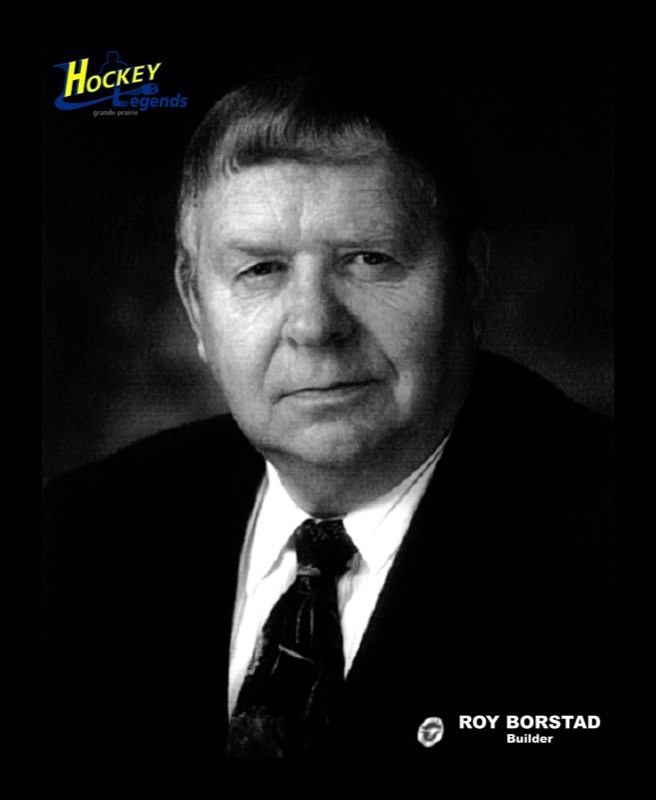 Roy Borstad - a Grande Prairie Hockey Legend in 2004.